April, 24-25：MEMS Engineer Forum at Ryogoku KFC Hall, Tokyo, Japan. June, 5-7：Smart Sensing 2019 at Tokyo Big Sight, Japan. June, 10-14：TEMPMEKO 2019 in Chengdu, China. June, 18-20：Gas Analysis 2019 at Fokker Terminal in Hague, Netherlands. September, 18-19：Chemical Material Japan 2019 at PACIFICO Yokohama Hall C&D, Japan. October, 15-18：CEATEC 2019 at Makuhari Messe in Chiba, Japan. December, 11-13：SEMICON JAPAN at Tokyo Big Sight, Japan. ■On September 8, 2018. We were awarded the Suntory Award and Nippon Steel & Sumikin Engineering Award at “The 6th Deep Tech Grand Prix”. ■Ball Wave presentation was selected to the spotlight lecture of The Japanese Society of Applied Physics. On March 19, 2018, our presentation, “Gas analysis method by using leaky attenuation measurement of surface acoustic waves”, was selected to the spotlight lecture of The 65th JSAP Spring Meeting, 2018 in Tokyo, Japan. Ball Wave gave another presentation, too, “Development of portable Ball SAW Moisture Analyzer by using USB Pulser”. ■Ball Wave presented a poster at IBA2018. On March 13, 2018, Ball Wave presented a poster, “Novel Moisture Analyzer With A Quick Response For Accurate Monitoring Of Lithium Ion Battery Manufacturing,” at the IBA(International Battery Association) 2018 in Jeju, Korea. ■Effective on 14th December, 2017, Ball Wave joined “ERATO Nakamura Macroscopic Quantum Machine Project” conducted by Japan Science & Technology Agency (JST), and participates in the research of hybrid quantum systems utilizing Ball Wave technology. ■On November 22, 2017, Ball Wave was awarded “The 20th 77 Business Award/77 New Business Grant”. ■We participated in the Falling Walls Venture 2017 on November 8 in Berlin, Germany. ■We were awarded 1st prize in Falling Walls Venture Sendai on September 21, 2017, and will be one of 20 finalists in Berlin who will compete for the Falling Walls Science Start-Up of the Year award on November 8. ■We presented a paper on the latest technology of our trace moisture sensors at an international conference on the standardization and measurement of industrial gases and natural gases, GAS Analysis 2017, held in Rotterdam, Netherlands, on 13-15 June, 2017. 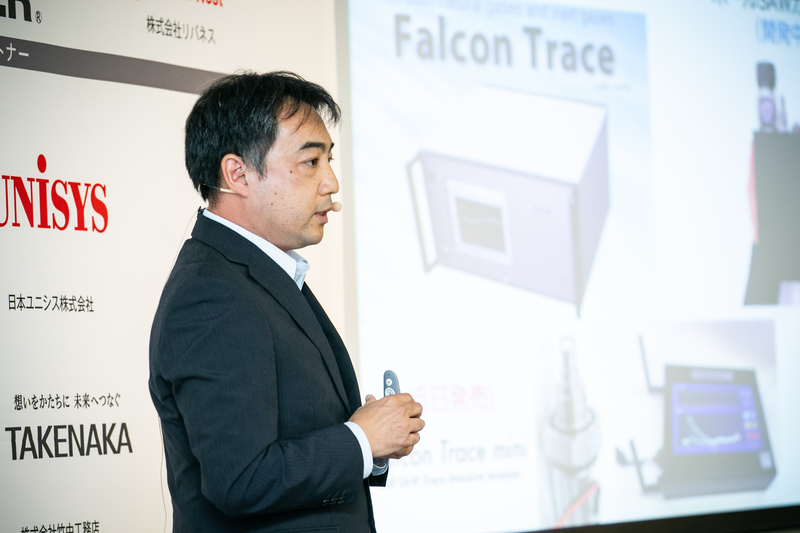 We demonstrated our first prototype of trace moisture measurement instrument, Falcon Trace, at the conference, too. ■We presented a technical paper on the principle of our ball SAW sensors and its application to trace moisture measurement at an international conference on temperature and humidity, TEMPMEKO 2016, held in Zakopane, Poland, on 29 and 30 June, 2016. Copyright(c) 2016 Ball Wave Inc. All Rights Reserved.